After traveling through multiple countries, I’ve learned there are many items we just don’t need when we’re on the go. Travel light by leaving these six items out of your bag. I’ll be honest: I have overpacked for many a trip, wasting space and adding unnecessary suitcase weight. After traveling for the past five years through multiple countries, though, I’ve learned there are many items that I just don’t need when I’m on the go—and I would bet you don’t need them either. If you want to make your pack just a bit lighter, leave these six items at home on your next trip—but make sure to bring my one go-to item that actually prevents me from overpacking. Unless you’re a professional YouTuber, photographer, or writer documenting your travels, you really don’t need to pack more than a smartphone and perhaps a camera. With your phone, you can look up whatever information you may need (and stay up-to-date with social media, if you so choose) and capture seriously impressive photos and videos. Honestly, with the latest improvements in phone cameras, even avid photographers are ditching their DSLRs. One optional additional gadget? An e-reader. If you like to enjoy a good book (or even a few) while traveling, this device is a great way to save space and weight. If you’re traveling for business and need to look your best, chances are you’ll be at a hotel that comes equipped with a hairdryer in each room. If not, think about whether or not you really need one. If you “rough it” and tie your hair back or let it air dry, you’ll not only save space but also not have to worry about blowing a fuse in a foreign country if you don’t have the right voltage converter. Chances are these basic toiletries will be available at your accommodation. If that’s not the case (perhaps you’re staying in a vacation rental that you have to stock), you should be able to load up on toiletries at a local convenience or grocery store. As with hairdryers, a travel iron is really only necessary if you’re traveling for work or another purpose that calls for business (or refined) attire. And even if that’s the case, most hotels have irons in each room or ones you can use. Otherwise, you can probably go out with a few wrinkles. And if you want to minimize them, you can do things like pack clothes in wrinkle-free fabrics, keep folds neat in a garment folder, stock up on a travel-sized wrinkle release spray when you arrive to your destination, or hang garments in the bathroom while you shower—steam really works magic on minor creases! If you’re going to be climbing mountains, running marathons, or traveling through snowy conditions, you may need some extra footwear. But if not, chances are you can get by with one or two pairs: For a warm-weather trip, pack a pair of sandals for the beach or casual strolls and a pair of close-toed, supportive shoes you can wear for the long-haul. For a cold-weather trip, bring one pair of versatile (and waterproof, if possible) boots and one pair of dressier shoes (if you need them). Keep your shoes contained in an anti-microbial shoe locker that keeps any dirt and unpleasant odor away from the rest of your items. Unless you’re headed to fashion week, do you really want to spend your precious travel time deciding on what to wear? Minimize the choice, and plan one outfit per day in advance, and make it all about simplicity and layering. Bring basic clothes in neutral colors that you can mix-and-match. Pack a few t-shirts, one cardigan or sweater you can layer on top if you get cold, one pair of versatile pants, and one pair of shorts or a skirt (if it will be warm). Need something dressy? Look for an option that can also be dressed down so you can wear it more than once. Pack as little as possible: Chances are, you can find a laundry service if need be; or you can grab some detergent and wash a few things in the sink or shower. 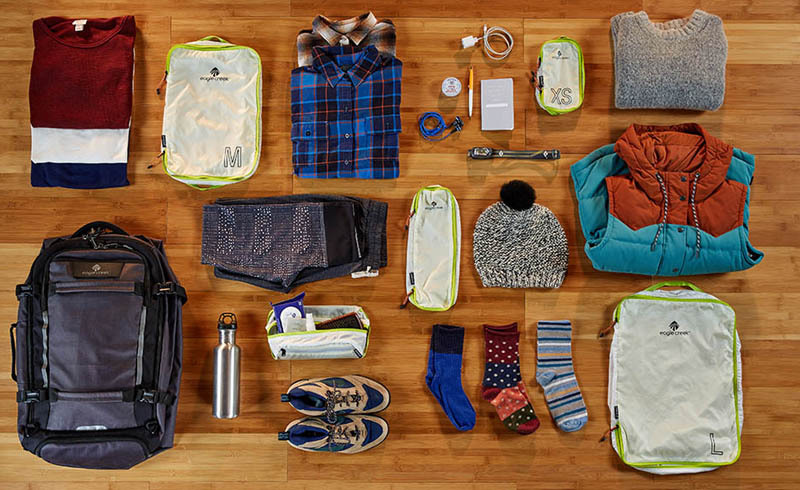 If there’s one thing you should absolutely pack, it’s a packing organizer. Versatile packing systems have transformed the way my wife and I travel. They keep our bags organized and prevent us from having to dig through suitcase chaos to find what we need. Compression cubes are perfect for maximizing luggage space, garment folders keep clothes neat, toiletry kits contain leaks, and clean/dirty cubes, well, keep the clean and dirty clothes separated. The bottom line: If your trip is approaching and you’re staring at a full bag with more things to add, just stop. In fact, go through and see what you can take out now that you have some perspective. Anything else you leave at home when you travel? Let me know in the comments!